Do you carry a heavy purse or tote around a back pack? Or maybe you’ve been involved in a traumatic accident or have sustained a sports injury? No matter the source, Windmill Health Center can help relieve your shoulder pain. Shoulder pain is a broad term that includes any pain that arises in or around your shoulder. Shoulder pain may originate in the joint itself, or from any of the many surrounding muscles, ligaments or tendons. Shoulder pain usually worsens with activities or movement of your arm or shoulder. 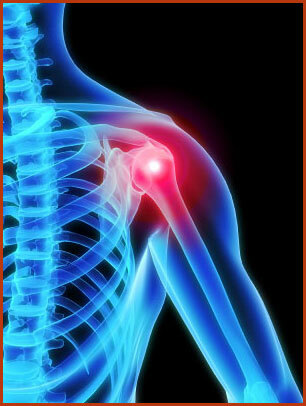 Arthritis in the joints around the shoulder (gradual narrowing of the joints and loss of protective cartilage). Bursitis (inflammation of a fluid-filled sac, or bursa that lies between tendon and skin or between tendon and bone). Normally a bursa protects the joint and helps make movement more fluid. Fractures of the shoulder bones. Shoulder fractures commonly involve the clavicle (collarbone), humerus (upper arm bone) and scapula. Frozen shoulder syndrome (also called ‘adhesive capsuliitis) is a common condition that leads to stiffness of the joint. It occurs when the muscles, tendons, and ligaments stiffen up inside the shoulder and make any motion painful and difficult. Shoulder instability occurs when the head of the upper arm bone is forced out of the shoulder socket. Tendinitis involves inflammation of nearby tendons, such as those connected to the bicep muscles of your arms, from overuse or injury. Shoulder separation (also called an AC separation) can result from a disruption of the acromioclavicular joint. Shoulder impingement occurs when the top of the shoulder blade puts pressure on the underlying soft tissues when the arm is lifted away from the body. Sports injuries particularly if you play tennis, racquetball, or softball or sports which put strain on your shoulder. If you have had shoulder pain in the past, use ice for 20 minutes on and 40 minutes off, and then repeat, after exercising. Learn proper therapeutic exercises to stretch and strengthen your rotator cuff tendons and shoulder muscles. In sports-related activities, learn proper techniques to prevent painful and expensive shoulder problems. Like any other pain condition, the sooner you get appropriate care, the quicker the pain will go away and allow you to go back to normal activities. Also, the sooner you get appropriate chiropractic care, the less likely you are to get a recurrent and chronic problem. Chiropractic adjustments: Although your shoulder may be hurting, your back and neck could be out of alignment, causing the shoulder to throb. For instance, when the structures in the neck are painful, the pain is often felt over the shoulder. Massage Therapy: Massage can relieve the stress in your muscles, relieve your body of toxins, and help increase your range of motion. Therapeutic exercises: Stretching the muscles and tendons that surround the joint can help with some causes of shoulder pain. Dr. Browner and Dr. Behar will work with you to develop an exercise program you can do at home. After a careful chiropractic examination (and an x–ray if necessary), our chiropractic physicians at Windmill Health Center will make an accurate diagnosis of the cause of your symptoms so that appropriate chiropractic treatment can be determined. At our chiropractic clinic, we look at your overall health, focusing not only on your shoulder, but also on your lifestyle, such as diet and amount of daily exercise. This integrated approach helps determine the best treatment for your shoulder pain. To help identify the cause of your problem, we will discuss your symptoms and previous injuries, your family health history, and your lifestyle, including recreational and work related physical activities. We use various methods of treatment for shoulder pain, combining the latest in kinesiology, massage therapy, physiotherapy and therapeutic exercises. If your shoulder pain occurs at night or while you are resting, or if your shoulder pain persists beyond a week, call Dr. Browner or Dr. Behar. As leading Weston chiropractors, the Windmill Health Center has successfully led hundreds of Weston patients to a pain-free existence. I read this article and found it very interesting, thought it might be something for you. The article is called Shoulder Pain and is located at http://www.windmillhealthcenter.com/conditions-treated/shoulder-pain/.